Having trouble with their emotions? Wait a moment. We recently had a day where all I could do was shake my head. although the day before had been in the high 80s, this day was in the low 60s, cloudy, with a continued breeze. This is spring in Washington, DC, varying, one day to the next. Thus, one day, shorts, next day, jeans. However - not for this little one. For her, rules and order are required - if shorts yesterday, then shorts today. She refused to put on the light jacket that her mother had hung in her cubby. I knew this was going to be a difficult walk. We headed outside for our daily walk, all the same. This little one would suffer the natural consequence of not dressing properly. We stepped outside the school and her tantrum accelerated. Here, outside in the air, was proof that it was chilly. Why walk and work up a sweat when one could cry and yell? Sharde, our beloved teaching assistant, took this child aside and worked one-on-one with her, challenging her to see how several classmates were also wearing shorts and not complaining. "Let's all be together, one community. We'll warm up as we walk. It's not so bad out here." I let Sharde work with her while I continued to lead the line away from the school. The children were more or less happy with the walk when all of a sudden, as luck would have it, it began to drizzle. Yes, it was no longer just cloudy, windy, and cool, but let's have some continual drizzle, too. This was turning into Alexander and the Terrible, Horrible, No Good, Very Bad Day. Now, it wasn't just the one child falling apart. I heard a chorus, "Ms. Ingram, Ms. Ingram! It's too rainy! We need to go back!" "What should we do? Turn around and get back to class and have a dance party? [we needed exercise] Or stay on our walk, because this rain is light?" To my surprise and amusement, the two leaders chose different options. I again gave the decision back to them. "You'll need to discuss this together and come to the same decision." Back and forth, the two children bickered. "Go back!" "No, walk!" I studied the line leaders. One was a first-born, used to calling the shots, "Go back!". The other was a second-born, relishing the position of opposite, "No, let's walk!!". The children behind the leaders grew louder with complaints - "Let's go back! It's raining too much! Let's turn around!" The drizzle and wind increased - or was it just the complaining? Ugh. What a disaster this walk was turning into. 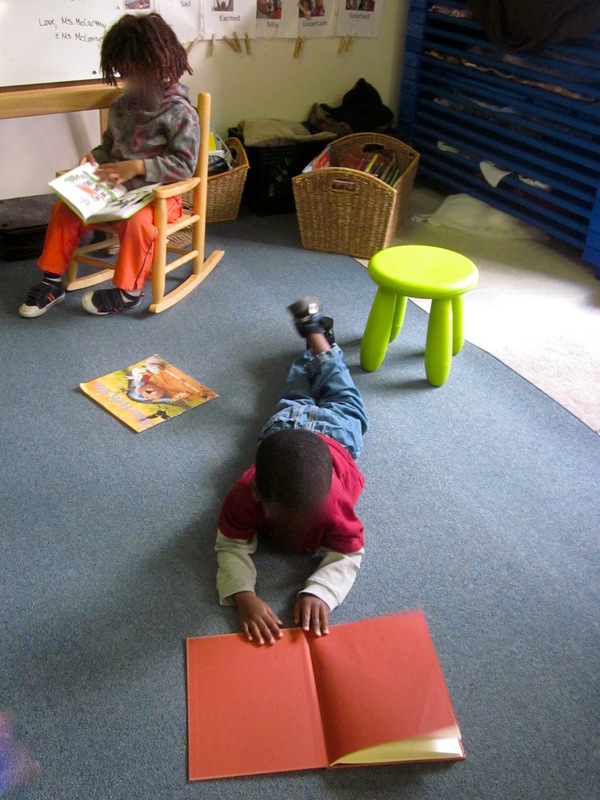 The child in the back with the teaching assistant was howling in pain and frustration. All the children were yelling. "It seems like everyone is very unhappy. I'm going to insist we go with the majority feeling - let's go back to school." The sweet second-born - who had been so adamant that we continue walking - quickly agreed, as if it had been a non-issue for him all along, "Ok, Ms. Ingram! Let's go back!". holding a large butterfly cage. "What are you doing?," I asked. "We are releasing our butterflies today. We have thirty butterflies! Would you like to watch?" We were almost back inside the school. It was still cloudy and breezy. But no one was crying or yelling anymore. The Big Cats stood and stared, in awe, as these lovely butterflies were released into the air. 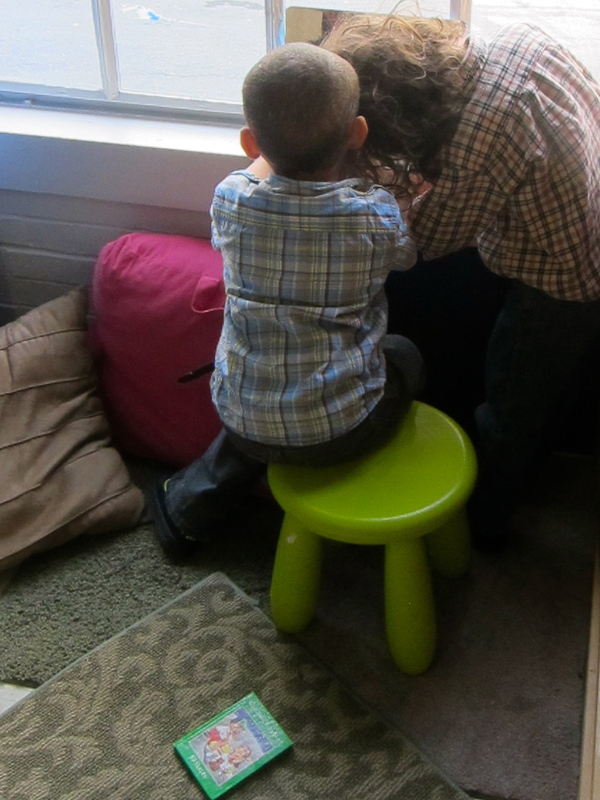 some wandering onto shoulders, hair, even outstretched hands of these enthralled preschoolers. Big smiles on all faces. The earlier misery was completely forgotten. What a great walk we had! seeing the wonder in small things. We were on the playground - our side alley, that is. flowing downhill towards our entrance. Nearby, a bin of chalk - and possibility! Someone decided to paint the path of the water. Others decided to follow suit. a beautiful, colorful, water path was created. What if we made sculptures that moved? Artist’s World – explored famous artists and used various materials to emulate their techniques. Cooking = exploring food preparation and measurement, with special recipes of hummus, pizzas, and smoothies. Healthy Bodies – studying nutrition, exercise, and care of our bodies. International Cooking – cooking from around the world, including Mexico, France, and Spain. 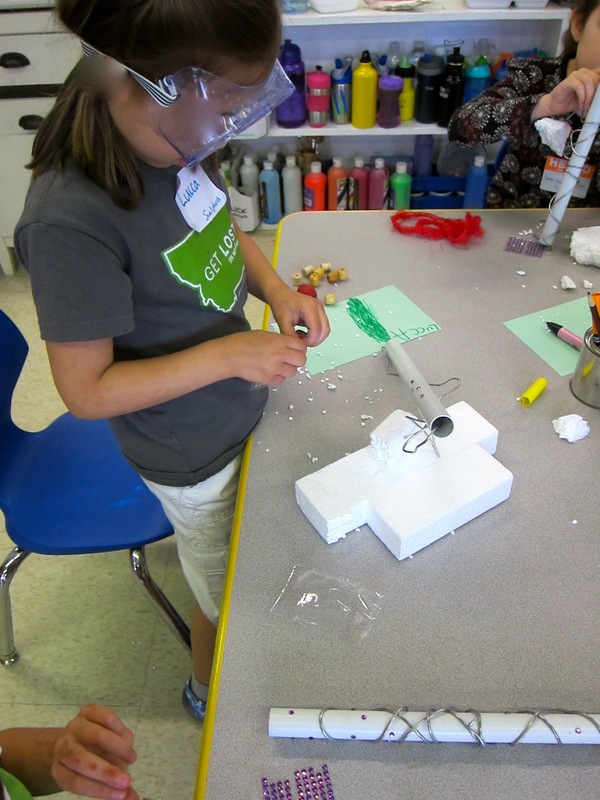 Ooey Gooey Science – experimenting with a variety of mixtures to create bouncy balls, snow paint, lava lamps, and magic growing trees made from recycled newspaper. Sculptures and Motion – explored wire, recyclables, beads, and found objects to create sculptures that moved. Spanish – learning Spanish about the body, exploring through song and dance. Worm Composting – explored how worms help break down leftovers and create compost; the children studied the worms and their features and made worm houses. Can you identify which intersession was mine, based on these brief descriptions? Well, I gave you a hint with my blog title! Yes, my colleague Jenny (Teaching Resident) and I ran an intersession on Sculptures and Motion. 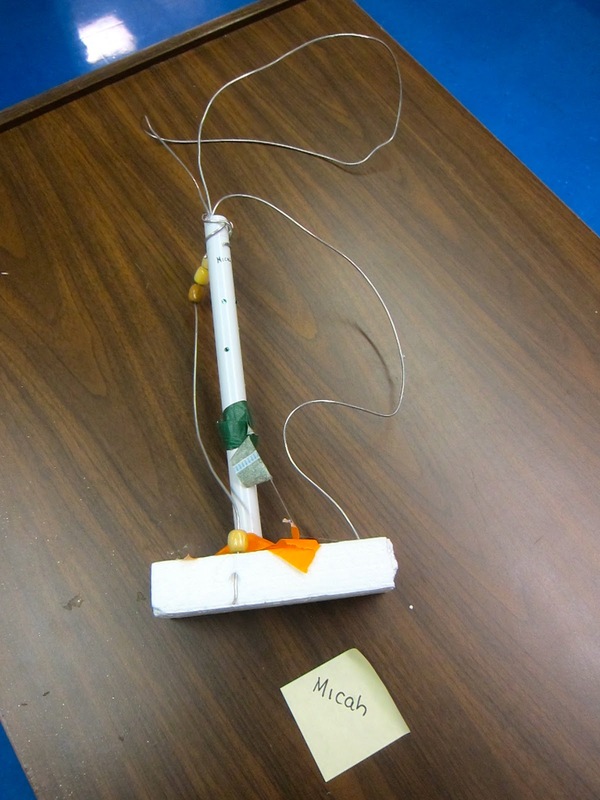 It was an exploratory, process-oriented class...we had some fabulous 12 gauge aluminum wire, lots of recyclables and found objects, and curiosity. A few days before the intersession was to start, Jenny and I discovered a bin of plastic tubes/rods in the midst of all our recyclables, donated by a family earlier in the year [leftovers from some sort of shelving structure that had fallen apart]. 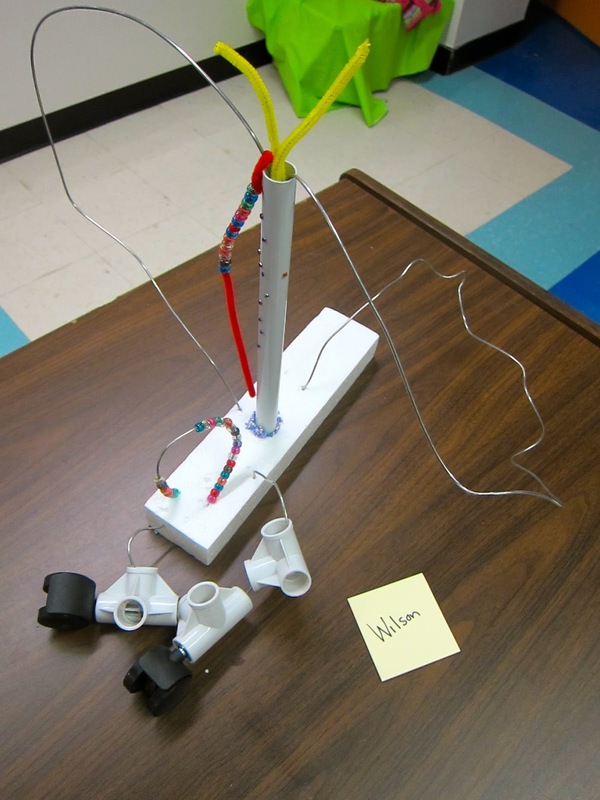 We decided that the wire could be used with these rods in all sorts of fanciful ways - we would give each student these materials to begin with, and see what transpired with these as the catalyst. We weren't quite sure what the outcomes would be...the children would guide us. 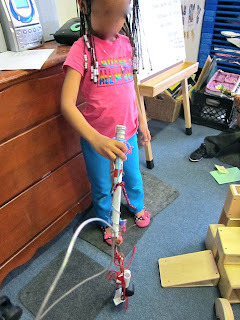 This is my favorite way to teach - let's just work with materials and see what happens! The question was posed - could we create sculptures that moved? 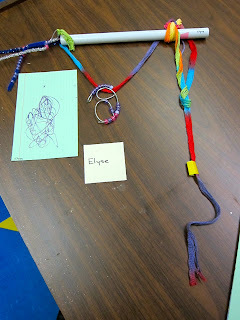 To begin, we had the children explore the wire - bending and moving it into all different shapes and directions. We had the children wear goggles this first day, to encourage them to slow down in their exploration, to use the sharp wire carefully and thoughtfully. They were delighted by this new material. 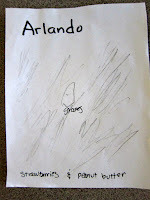 We then asked each child to draw a plan - a blueprint - of their sculpture design. Now, it was time to build! We couldn't work with twenty students at once. 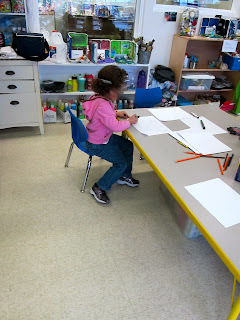 We decided to set up small groups, doing a variety of different things. 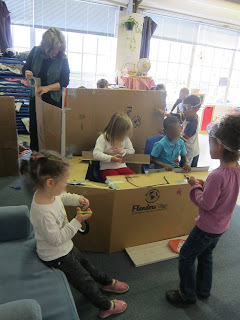 While some worked on creating sculptures, others did free-form building in the block corner, creating block sculptures and imagining their wire sculptures. 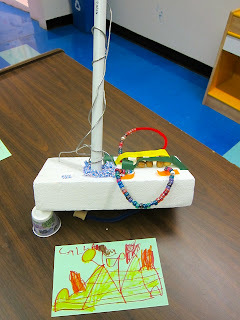 Another small group worked with cardstock and markers, cutting paper gears and decorations to add to their sculptures. 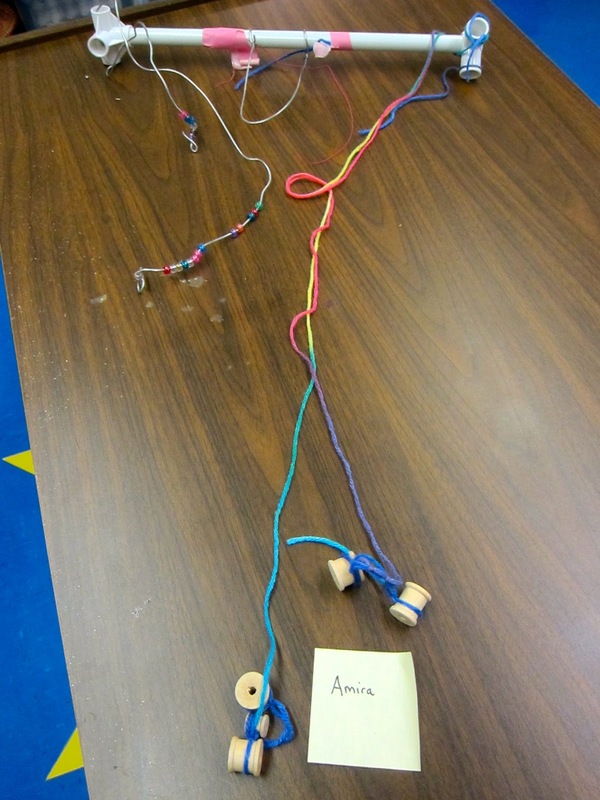 Lastly, I set up a tree stump with nails (partially hammered into the trunk), for freeform exploration of the wire and pipe cleaners, to channel some additional discovery by students who were using wire for the first time. We rotated the children through these areas, allowing each student a good thirty minutes of sculpture work each of the three days of intersession. 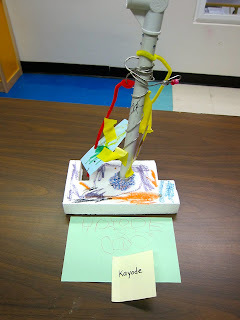 It was fascinating to watch the children create sculptures. Each student was enchanted by the materials, in their own way. fixing and then undoing, rechecking one's work. It was not just children the children who were immersed in this work. On the second day of intersession, Jenny and I totally forgot to watch the clock and announce clean up... the next thing we knew, the intersession period was over and my regular "Big Cats" came racing back into the room. What a scramble we had, all of us, putting everything back in its place. I would love to explore wire sculptures again - for much longer than this three day special program. I've run out of time this school year...but, next year, yes! There is so much more to discover! 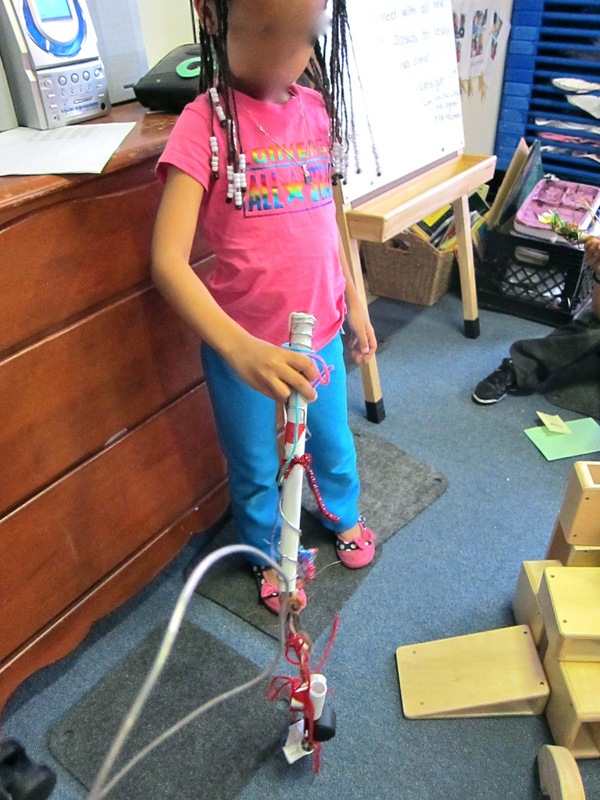 Amira's sculpture was so tall, she had to stretch her hands up high and stand on tippy-toes to hold it. Calla's sculpture and blueprint; she was so proud of how she used spools beneath for sculpture to roll. I walked to school a new way the other day. set up as an acrostic. The letter "L" was for LEARNING. The letter "E" was for EARN RESPECT. what "A" and "D" meant. It echoed with each step I took to school. Wow, those two words together really rankle. Is the goal for students to EARN respect? I wonder, what am I missing here? Am I misinterpreting the message? I wonder, how does a student earn respect? What does he/she have to do? I wonder about the word choice. I wonder about highlighting this in one's motto. Making this your community goal. or, "expect to be shown respect"? or, "see respect modeled by one and all"? or, "You will be respected"? I hope my students feel respected by me. to be respectful of others...their peers, their teachers, their siblings, on and on. Should we demand that our students earn respect? What does a child have to do to earn my respect? Show up in my class. Why do you sit in a chair? We've started a new fun ritual at the start of our day, wherein the students themselves take turns asking the question of the day on the whiteboard. I've seen this done in older classes but I hadn't tried it at the preschool level. Laura McCarthy (Teaching Resident) decided to give it a try with our class and I have really enjoyed seeing how excited the children are about this daily pastime. We invite the children to consider what they want to learn from their peers or what they want to know about their peers. Do you have a pet? Yes or No? What is your favorite food - macaroni and cheese, pizza, spaghetti, other? What is your favorite - airplanes, helicopters, or trains? What do you like for breakfast - oatmeal, muffin, cereal, other? Do you like princesses? Yes or No? I was delighted to see how the children answered. "I don't know," being their immediate response. I loved this question! I loved how one simple question gave me a window into children's cognitive processing...how they think. What about food and cooking? We've started a new exploration - all about food, with a special emphasis on nutrition and cooking. We've been talking all year about healthy food and healthy habits...now we're experiencing how delicious it is to cook and create together. 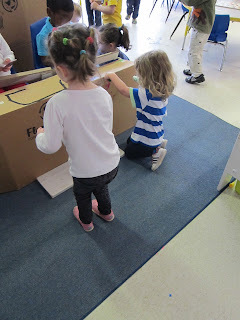 We are taking so many fun tangents...such as creating a super big cardboard food truck! 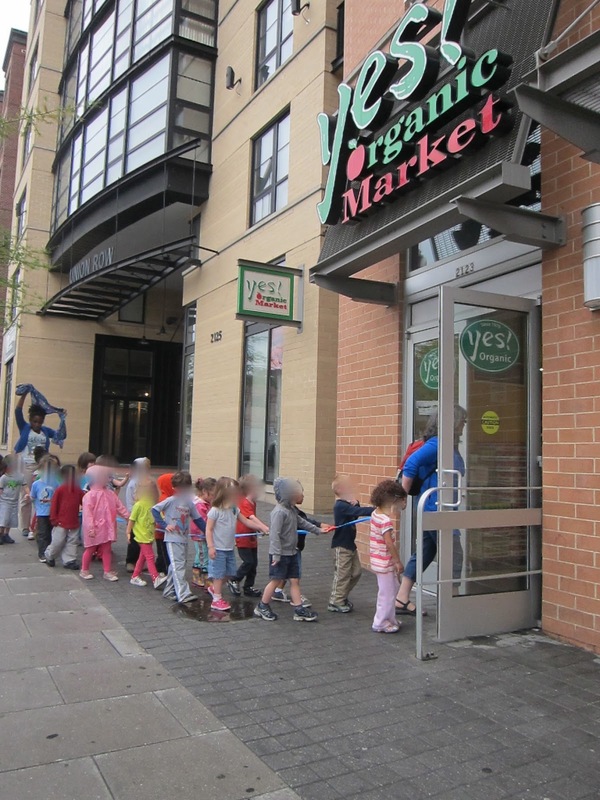 We needed something big enough for us to climb into, allowing us to pretend to deliver school lunches to our school (we watch a real truck come and go everyday in our alley), or to sell food to employees downtown and throughout the city, or perhaps it is a farmer's market food truck. So many uses for a good truck when you are working with food! It took a lot of hard work, focused creativity, everyone working together, but we did it!! Don't forget that the truck needs a label! We'll write "food" on it. On second thought, let's paint the truck and we'll add a new "food" sign later. Cooking is a big part of this unit. 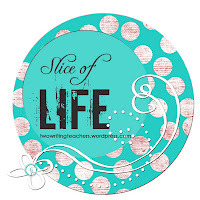 We are creating at least one yummy and nutritious recipe a week, with a special emphasis on "healthy eating." The teachers are selecting the recipes based on available cooking tools and children's interests. We don't have a kitchen at our school, but we have electricity...so we have an electric skillet, blender, wok, food processor, etc. Other than the recipe selection, the children are doing all the doing! - walking to the local grocery store for these ingredients. 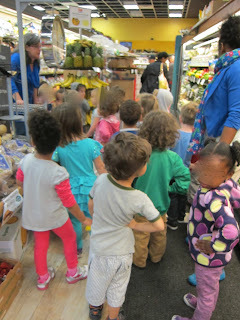 Here we are, walking to the grocery store to purchase the ingredients for our first recipe - making fruit smoothies. Believe it or not, we totally surprised a couple men that were stocking shelves - the children were so quiet, patient, and calm, they looked up at us and went wide-eyed, as if to say, "Wow! Look how many children!" I thought a lot about how to organize the cooking experience so that each child gets the opportunity to measure and mix the ingredients. We divided the class into four small groups (randomly assigned by choosing a numbered craft stick) for each cooking experience. Each recipe will be created four times from scratch. Our first week, we made smoothies! 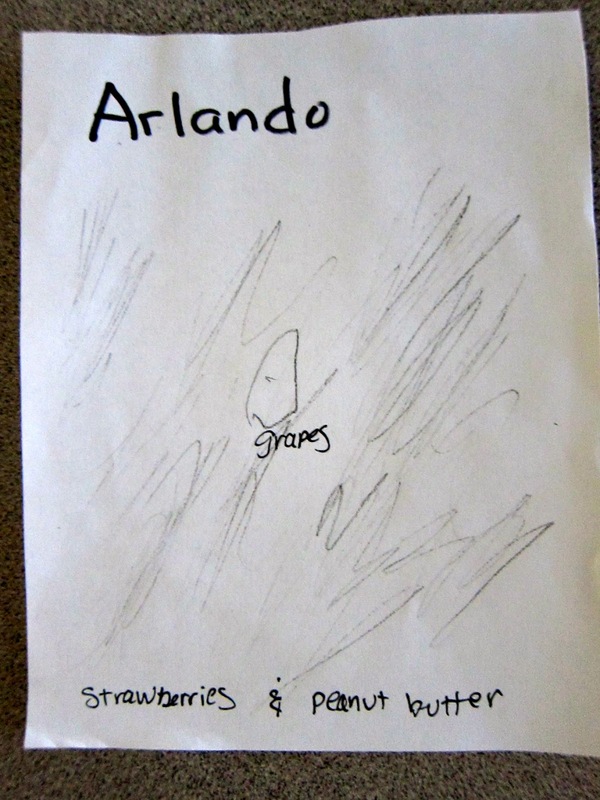 Our ingredients included frozen mango and mixed berries, fresh strawberries and bananas, rice milk, and vanilla yogurt. Each small group worked together to decide the special ingredients to include in their fruit smoothie. The children had lots of fun cutting, chopping, measuring, pouring, and pushing the buttons on the mixer, trying out the different speeds. Everyone agreed - yum!! We enjoy the "science" aspect of cooking. One extension has been our sensory table, where we have been making many different "mixes" and seeing what happens when different ingredients are put together. One day at morning gathering, we had a special visit from a crazy chef/scientist - "Chef Goop," who looked and sounded a lot like Ms. McCarthy except for her goggles, chef's hat, and apron. Chef Goop invited the children to explore mixtures with her - oil and water, flour and salt, salt and water, baking soda and vinegar, egg and flour. The children mixed, smelled, observed, guessed, and tasted (everything but the raw egg!). We explored and discussed the different chemical reactions of food - dissolving, emulsion, and more. I was delighted by how much the children remembered from this dramatic improvisation...Chef Goop will be returning in the near future! Of course, it wouldn't be my classroom if we didn't do some sort of engineering. I found a new version of one of my favorite Russian folktales at the library - Grandma Lena's Big Ol' Turnip by Denia Lewis Hester and we built devices to get a giant turnip out of the ground. This led us to wondering about gardening - how plants grow, how to take care of plants, how big do plants become. On several days, we have served lunch "farmer's market style." 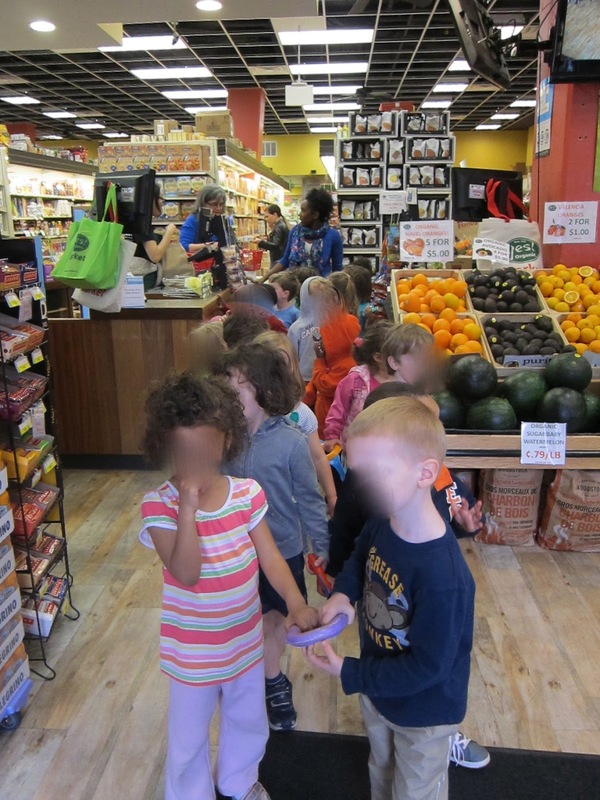 Here, the children are given five play coins to "buy" snack. The fruits, vegetables, and grains were set up as three separate stalls (tables) in the classroom and the children visited all three places to buy themselves a balanced snack. What a fun way to reinforce their number sense, too! Yes, all of us - teachers and preschoolers - are really enjoying this new exploration. It is clear that we have many budding chefs and scientists! !